If you’re looking for food recipes that could make your carenderia or restaurant stand out from the other, these pinoy best food recipes might help you. 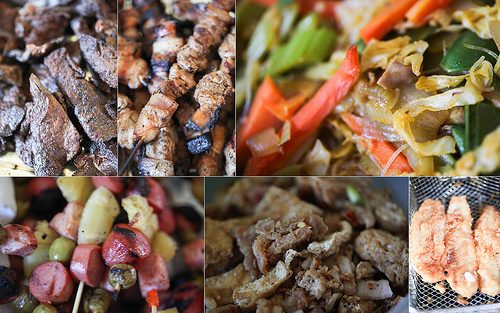 These are popular Filipino foods that most Pinoys love to eat and could bring more income on your pocket! • Heat oil in a cooking pan. • Sauté the garlic and onions. • Then add the beef, soy sauce, beef broth, salt and pepper. • Bring to a boil then simmer until beef is tender. • The above beef guisado recipe can be used for vegetables and other meats. • For vegetable dishes, replace the beef with about 200 grams of pork and add the vegetable (e.g. Baguio beans). The salt and pepper can be omitted. • Reduce the broth to 2 cups for vegetable dishes or use plain water instead. • In a casserole, sauté garlic, ginger and onions then add the pork. • mix in the gabi leaves. • Pour in the coconut milk (gata) and bring to a boil then simmer for 15 minutes. • Add jalapeno, bagoong, salt and MSG and simmer for another 5 minutes. • Add the coconut cream and continue to simmer until oil comes out of the cream. • Serve hot with plain white rice. • In a pan or wok, heat cooking oil and atsuete oil. • Saute garlic, onion. Then add the pork, liver, chorizo de Bilabo, tomatoes, bell pepper, paprika, patis and the stock. • Cover and bring to a boil. Simmer for 20 minutes or until the pork is tender. • Add the chickpeas, potatoes and raisins. Boil of another 2 minutes. • Serve hot with white rice. • In a casserole, put pork in water and some salt. • Bring to a boil and simmer for 20 minutes or until the pork is tender and the skin is soft. • Remove pork from water. • Slice the pork into bite sized pieces while still hot. • Place in a bowl and add vinegar, soy sauce and chopped, uncooked onions. • 1 kilo whole chicken, cut into pieces. • 1 small young papaya or sayote, cut into small pieces. • In a stock pot, heat oil and sauté garlic, onion and ginger. • Add water and the chicken. • Bring to a boil and simmer for about 20 minutes or until chicken is almost done. • Add papaya and continue to simmer for an additional 5 minutes or until papaya softens but not overcooked. • Add sili leaves then turn off the heat. • Serve steaming hot on a bowl with plain rice on the side. • Place the pork in a saucepan. Add vinegar, garlic, pepper, salt or toyo (soy sauce) and water. Cover the saucepan and cook slowly until the meat is tender and most of the broth has evaporated and only 1/4 cup remains. • Drain, separate the pieces of garlic from the pork and fry in oil until brown. Add the pieces of pork and fry until brown. Add the broth and let simmer about 5 minutes. Serve hot. • Grate the coconuts, extract the milk and set aside. • Add 2 cups of hot water to the grated coconut and make the second extraction. • To the camote, gabi, ubi, banana and langka add the thin coconut milk, sugar and tapioca and bring to boil stirring milk before removing from the fire or use it as topping. • Heat broth and water in a saucepan to boiling. • Add rice; reduce heat, cover and simmer until rice is tender about 15-20 minutes. • Remove from heat. In a bowl, beat eggs with a rotary beater until light and frothy. • Slowly beat lemon juice into eggs, then gradually beat in 1 cup of the broth mixture. • Stirring constantly,slowly add egg mixture to remaining broth in pan. If making ahead, chill at this point. • Just before serving, heat soup until hot, but do not boil. Serve with a sprinkle of parsley. • Mix all ingredients in a large enamelware or nonaluminum pot. Broil and simmer for about 2 hours. • In a large pan marinate fish with soy sauce, vinegar, garlic, and ground black pepper. Place the Milkfish skin side up, cover, and set it in the fridge for an hour before cooking. • In a large frying pan heat oil about ¼ in deep and fry the fish skin side up first for 4 minutes. Then carefully turn the fish over and let it fry for 5 minutes. Next turn it back skin side up and fry for an additional 2 minutes. Serve with rice and slices of tomato and onions on the side. Enjoy! • Marinate the beef in calamansi or lemon juice, soy sauce and pepper. • Heat the oil and pan-fry the beef until medium rare. Transfer to a plate. In the remaining oil, sauté the onion until tender. • Garnish the beef with the remaining onion rings. • Saute the garlic first and then the onions in hot cooking oil till golden brown. • Add the stock, patis, pepper, and vetsin. Cover and boil for 15 minutes. • Drop in patola. Cover and cook for 5 minutes. • Uncover. Break misua into short lengths and drop into the boiling broth. • Cover. Remove from fire immediately. gusto ko madami pa akong malalaman sa pagluluto.